A quality cabinet, engineered for versatility and value, at an affordable price. Available in more than 360 off-the-shelf sizes and three different side styles - Standard, Handle and Rack. The Uni-Pac is constructed with .063 aluminum tops & bottoms and fronts & rears and with .125 aluminum sides, includes four adhesive rubber feet. The top, bottom and sides are finished in textured blue (Federal Spec. No. 595A-25109). The front and rear panels are finished in semi-gloss white (Federal Spec. No. 595A-27722). Also available in semi-gloss black, black textured or plain aluminum. Precision manufacturing throughout provides unmatched ease of assembly and disassembly. All parts are easily removable for access to components. Uni-Pac component parts, being interchangeable, are packaged in pairs (front and back panel, top and bottom panel, side panels) and are available in single units. 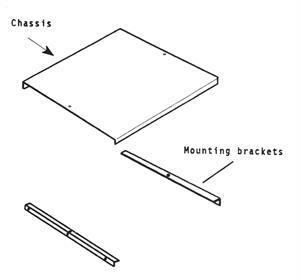 To construct a complete cabinet you'll need a front and back panel package, a top and bottom panel package, and a side pair package. Order by height, width and depth. Always specify side type (Standard side "S", Handle side "H", Rack side "R"). 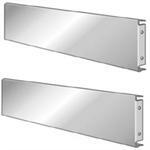 When ordering a 5 x 4 x 9 enclosure with Standard Sides, designate UPS-525-4-9. Optional top and/or bottom panels vented with slots. Optional chassis available for all sizes, mounts come in pairs and in three different heights: 1 inch, 1 1/2 inch, and 2 inch.